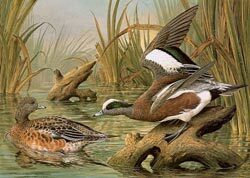 Basil Ede, the acknowledged master of wild bird painting, was commissioned by the Warner Collection of the Westervelt Company to paint the most comprehensive and intimate portrayal of America’s wild birds. These dramatic, engaging limited edition prints are now available and must be seen to truly be appreciated. Each image is accompanied by a certificate of authenticity and the Warner Collection offers a guarantee of complete satisfaction. Ede’s original Wild Birds of America paintings are retained by the Warner Collection, assuring they will not be reprinted. Only the finest papers and meticulous printing procedures were used to ensure that each image is faithful to the original. Each print was carefully inspected by the artist before being signed and numbered.